TUE. OCT. 6 The Holy and Glorious Apostle Thomas. 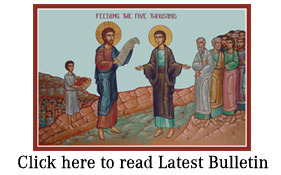 WED. OCT. 7 The Holy Martyrs Sergius and Baccheus. THU. OCT. 8 Our Venerable Mother Pelagia. FRI. OCT. 9 The Holy Apostle James Alpheus. Our Ven. Fr. Andronicus & his wife Athanasia. Our Righteous Forefather Abraham and his Nephew Lot. The Holy Martyr Dennis, Bishop of Paris. SAT. OCT. 10 The Holy Martyrs Eulampius and Eulampia. SUN. OCT. 11 TWENTIETH SUNDAY AFTER PENTECOST. MEMORY OF THE FATHERS AT THE SEVENTH ECUMENICAL COUNCIL. The Holy Apostle Phillip, one of the Seven Deacons. Our Venerable Fr. Theophane, the Artist and Hymnographer, Bishop of Nicea. Our Holy Father John XXIII, Pope of Rome.